The Santa Barbara Zoo and Roots 'n Shoots are sponsoring the Island Fox Festival this weekend. It is a great opportunity to learn about the various conservation efforts of Roots 'n Shoots youth groups and to meet a Channel Island fox. Even though the island fox enclosure is closed for remodeling, Finnigan, an island fox born at the Zoo last year, will be making appearances at presentations during the day. MORE on Finnigan. Friends of the Island Fox will be participating in the festivities during the day. Come by and visit us. This is a wonderful family event with music, crafts and activities. More about Roots 'n Shoots. Friends of the Island Fox offers FREE programs about the endangered island fox and the Channel Island ecosystem to school children from 3rd grade through college. 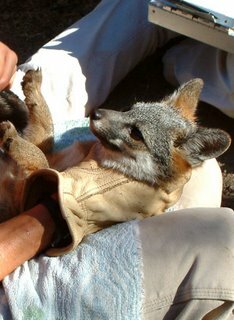 Depending on participant age and group size, programs include interactive program, video of an island fox release, radio-collar tracking demonstration and hands-on materials. As we all go Back to School, here are a few questions we have received from students. 1. How long do island foxes live? Island foxes typically live eight to ten years in the wild. While they are not considered to be adults until age two, in some cases they do form mate pairs and have their first family before they are a year old. 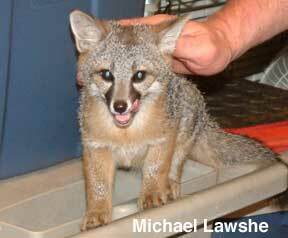 When wild foxes are examined by biologists, the wear and condition of the island fox’s teeth help the biologist determine the animal’s age. 2. Can an island fox hurt a person? The island fox is a very small member of the dog family. Their average weight is only 5 pounds and they stand just over a foot tall. They do have sharp, pointed teeth for eating insects and hunting mice and birds, but an island fox is more likely to run from people than to threaten them. An island fox will try to protect its home territory from other foxes. Some foxes have scars from territory struggles with other foxes. Island foxes sometimes bark at intruders. See the Video of a barking island fox. 3. Can an island fox handle the snow in the winter? It rarely snows on the California Channel Islands in the winter. The ocean that surrounds the islands helps to keep the weather mild. However, it can be cold, foggy and very windy on the Channel Islands at times. Being small helps the island fox stay out of the wind and their fur is short and thick to help keep them warm. 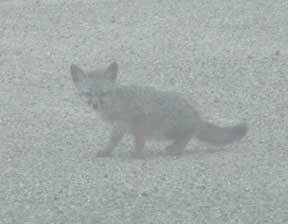 In the fog, this island fox pup's gray coat helps it blend in against the dry summer plants and the island rocks. 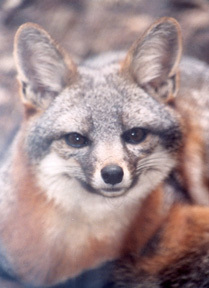 Do you have a question about the California Channel Island fox? Friends of the Island Fox, a program of Channel Islands Restoration, a 501(c)(3) nonprofit organization, which supports efforts to preserve and protect the island fox (Urocyon littoralis) on the California Channel Islands through conservation and education programs. Subscribe to our bimonthly e-newsletter and keep up-to-date on important happenings regarding the island fox. Newsletter recipients receive early notification of island trips and FIF events, as well as conservation updates. © Friends of the Island Fox 2018. Awesome Inc. theme. Powered by Blogger.